It seldom happens that the sales team reach out to a completely clueless customer. Thanks to the gamut of resources available on the web, customers prefer self-learning than subscribing and waiting for a contact person to call back. And that is one of the biggest shifts in the industry. To comply with this shift, digital marketing automation became the most touted solution for marketers to generate leads. Marketing teams became singularly powerful, giving way to inconsistent alignment with the sales team. Result: customer complaints increased- because, at the end, a customer has to interact with both the Marketing and Sales team during its buyers’ journey. To increase sales revenue, alone digital marketing is not enough. What happened next was Marketing automation- a powerful and potential tool for marketers. Marketing automation emerged as the connecting line between marketing and sales team. Bringing these two teams together not just helped increase sales revenue but also ensured customer loyalty. When you are aware of when to make a call and to whom, what to listen and what to say, you successfully close a deal. And this information is gathered through marketing automation software. Marketers can track and measure the lead behavior based on which they can identify the most qualified leads that are almost ready to hit the ‘buy’ button. Thanks to marketing automation tools, salespeople do not need to make cold calls. Rather they connect with those leads that are themselves looking forward to an on-phone conversation with a representative. This is just one of the many effective ways businesses increase sales revenue with automation. Here are 9 other ways in which you can increase sales revenue with the aid of marketing automation. Customer Sale’s for Pardot increased by 35% on an average after implementing marketing automation. When a lead signs up or subscribes with a brand, she is not looking for sales representative immediately. This is actually part of her research. Hence, if your sales representative makes a call at this time, you know you have killed your chance single-handedly. Marketing automation has the potential to create the perfect framework determining when is the right time to call a lead. Automation tool will ring the bell for your sales representative to intervene when the time is just right. For example, when a lead downloads your eBook or posts some queries on your website, your automation tool will make a note of this behavior. Your sales representative will receive alerts as per the conditions you have set in your marketing automation system. Like in this instance when the lead downloads an eBook, you know there’s still time before the sales call makes way to her. Rather, when she posts an inquiry, that’s the best time to reach out- because clearly, she is asking for help outright! You can cut down the response time of your leads with behavior-based alerts like above. It also speeds up the conversion for an organization. Lesser lead response time and quick reply from brands= That’s the perfect recipe to increase sales revenue. Studies show that nurtured leads convert faster, thereby shortening the sales cycle. Not every lead that visits your website is ready to stay long-term or even remotely considering making a purchase of anything similar to your brand. But amidst all the leads, there are those potential leads who are looking for more information to reach a conclusion and make a purchase. Yet these leads are not yet ready to take the sales call. They are still looking for information. Automation helps in nurturing these leads with adequate information and resources, guiding them all the way to the bottom of the marketing and sales funnel. This is where we again go back to remembering that marketing and sales team alignment is vital for a nurtured lead to get converted. When a lead, after series of email campaigns, SMS, guides and other resources, exhibits buying signals, the sales team comes in the picture. Automation helps in identifying the activities of each lead on the website, track their engagement with the email campaigns, analyze their social interaction with the brand and how much time they spend on the website/mobile/any other device. Based on all these information, information and resources that are most relevant are pushed via email campaigns, webinars, free eBooks, contests, etc. All these are triggered by automation tool. Once a lead is well-informed and shows signs of being convinced enough, they reach the bottom of the funnel where the sales representative makes a personalized call. Again, this call is not like saying Hello and ranting about your product or services. The sales call is also highly customised and aligned to the interests and activities of the lead. Note: This prospect, let’s call her Priya, has been browsing about Android courses on an online education portal, say Androiders, and had subscribed for updates as well. After few weeks, she posted an inquiry regarding the new course start date and other details. And that’s how a lead like Priya gets converted. 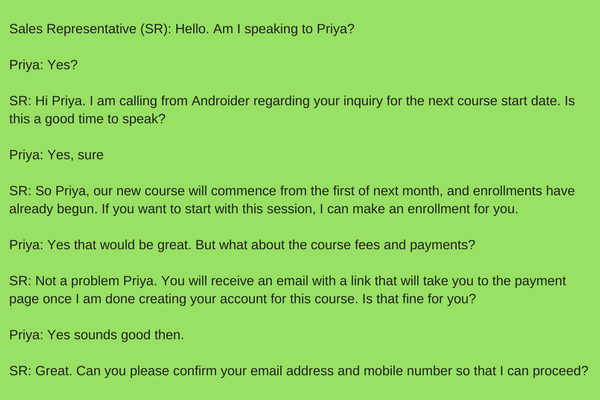 In this case, Priya exhibited all the signs of becoming a student for the upcoming Android class. The sales representative had all these details with her based on which she could initiate a personalized conversation that was not fake or made-up. Also, since she offered to create the profile for Priya, it was icing on the cake. Tip: Personalisation is not a facet restricted to marketing only! Use it to increase sales revenue as well. Email Marketing Automation is the most touted feature when it comes to automation. 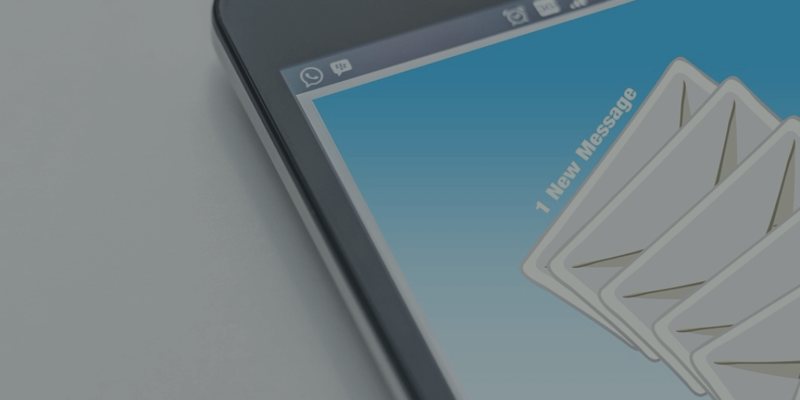 Businesses prefer emails to communicate and connect with their customers. It not only increases the chances of building a personalized relationship but also pushes leads through the sales and marketing funnel. Whether it is the marketing emails or transactional emails, automation helps in sending personalized emails automatically or when triggered. For instance, when a new user subscribes, a welcome email is sent automatically. 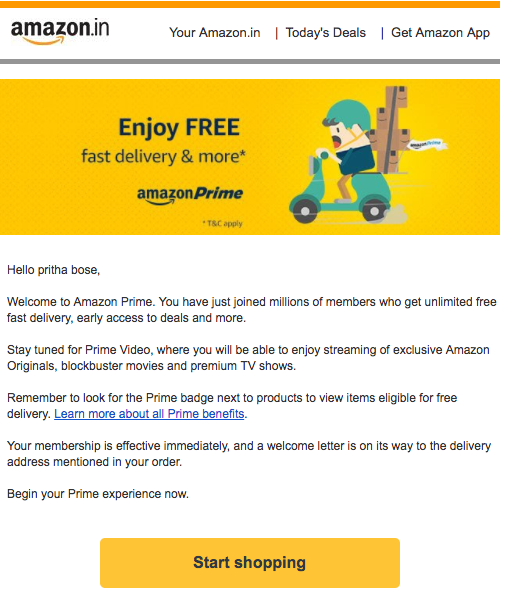 This email usually has a welcome message and a little brief about what the user can expect from the brand. The email is mostly concluded with a bold Call-to-Action button or links to help the user get started. If you integrate a CRM (Customer Relationship Management), you can keep a track of all the conversations with each lead – whether automated or not – to refer later. Lead scores are another automation feature that helps in deciding whether a lead is actually ready for a sales call or not. For each activity of the lead, a specific score is assigned. The lead that has the highest score in a specific time span is deemed as the most potential lead and sales-ready. You might get hundred visitors to your website but not all of them are worth your time. Those who are, may not be ready to talk to the salesperson at that moment. And to add, even if a lead is downloading the form, she still may not be a qualified lead. If you are passing a lead that has only downloaded your form to the sales team, you are again messing things up. By putting the lead and salesperson together at a time when the lead is not ready and the salesperson has less information- you are disrupting the flow of the buyer’s journey. The conversation will happen between two people who are not yet fully informed. The salesperson has no idea what exactly to say to close the deal. So, we again come back to the sales and marketing team alignment. If these two are not working together, disruptions are bound to happen. Hence, the priority is to first understand the lead’s behavior clearly. For this, an automation system is the best solution. A competent automation tool can identify which lead is ready for sales by tracking lead activities, engagement, and assigning specific scores to them. Since these scores are behavior-based, it helps in segmenting users. It not just saves time for your sales team but also increases the chances of closing the loop. Scoring is closely followed by proper segmentation which effectively helps in designing the sales call content. I’d say, the bottom line here is: Talk to a lead when it wants to talk to you, and prior to that know exactly what that lead wants to say and hear from you. An automation system gives you the power to analyze customer data. With detailed reports and performance graphs, it is possible to identify the purchase pattern of a lead. Clubbed with this, information about their earlier purchase, old interactions, and lead scores- automation helps in maximising the customer lifecycle through up-selling and cross-selling. An automation system has a robust dashboard that gives a complete overview of the lead behavior, conversation history, pre-purchase and post-purchase activity details, campaign engagement details, and other customised information. All these information when put together helps the sales team understand the lead better. They can offer services and products that are relevant and required by the lead, rather than throwing arrows in mid-air! What happens if your content is not relevant? According to an infographic from Kapow– 68% customers leave because they perceive that you are indifferent to them. Brand loyalty does not happen in one day. It is an emotional connection that flourishes over the time. Although it is time taking and requires a lot of effort, if you are not giving your customers what they are looking for, they will leave. The same infographic also reveals that if you can bring down customer defection by 5%, it will show an increase in profit by 25%-125%. To understand where to start and why you must follow this TED talk by Simon Sinek. Automation is not just about nurturing new leads and pushing them through the funnel. Re-engage with old leads who were once active on your platform. These leads were interested in your product/services and probably had made few purchases as well. Now, for some reason or the other, they have become dormant. Re-engaging with these users with new content and better offers can boost your sales. Another factor that many doesn’t consider is- these leads were associated with your brand because you managed to solve one of their issues at that time. Probably your salesperson also had a one-to-one talk with these leads. By looking at your CRM records and scouting through those conversation histories- you can identify who spoke and to whom, when, and why. Rekindle that conversation but with modified and updated content. It is said, re-engagement of leads increases conversions. Also, these leads will require lesser nurturing than new leads, which means short sales cycle. I did mention in the starting that customers prefer self-learning than an ill-designed sales call. But taking this trait for granted is the first mistake many make. I did too! It may sound like a paradox but customers love attention. They hate cold sales call. If you are thinking to connect via phone call, you will need to be armed with a comprehensive understanding of your customer’s choices, purchase history, and general browsing pattern. Customers will always want to talk to someone they are familiar with and someone who knows details about them. For instance, if I get a call from an E-retailer regarding a product that I never browsed or would ever consider buying, I will get irritated. But if I get a call from that same platform regarding a purchase I recently made and also updates about products that I browsed sometime back, I might want to tune in! It is wrong to say that sales representatives do not enter the paradigm in the earlier stages of buyer’s journey. Actually, it is important that a salesperson builds a relationship with the leads when they are in their earlier stage of the buyer’s journey. And to do this, an automation system is essential. Automation helps in creating triggered-based emails that contain content relevant to the prospect’s behavior and actions. Instead of getting a cold-call, the prospect gets an email with a relevant offer from the salesperson’s email address. This email is swiftly followed by a properly designed and nurtured campaign. In marketing terminologies, we call it ‘drip campaigns‘. Relevant content and valuable information are always the best way to nurture and retain a lead. When you are sending an email from the salesperson’s email address, you are positioning that sales person as the source of all resources. Like I mentioned earlier, customers like to talk to someone they are familiar with. By creating campaigns and sending emails from this email address, you are building a familiarity with the salesperson. To increase sales revenue, marketing and sales team needs to sync- true. But that’s not it. The systems these two teams use should also be linked together. If you are not integrating a CRM with your automation system, it is not possible for the two teams to collaborate instantly. While CRM is an important operating system for the sales team, same is automation for the marketing team. If the information is not flowing smoothly between these two systems, the teams remain out-of-sync. Hence, generating new customers and nurturing them gets interrupted. To provide a complete customer experience and increase sales revenue, an amalgamation of the two systems is necessary. So, when you are choosing an automation tool, you’d better check the CRM integration part. 9. Close the Loop with Marketing, or not! Continuing from the last point, a holistic customer experience depends heavily on the proper alignment of sales and marketing. This maintains the consistency in services and adheres to customer expectations as well. Often disrupt is noticed between sales and marketing, owing to the fact that they both feel they have the upper hand. While marketing focuses on generating leads in quantity, sales have more interest in quality. When these two harmoniously function together with an automation system, they both get to see the entire buyer’s journey clearly. After the sales call is done, the salesperson needs to send feedback to the marketing person. Based on this feedback and customer behavior details, marketing team once again launches post sales nurturing campaigns. But is that the end? NO. It is like a loop- continuous. The post-sales nurturing campaigns also require the salesperson to intervene when necessary. It is more like a bridge that joins the sales and marketing for a better customer management, nurturing and increase in sales revenue. Marketing uses automation to measure and track everything, while sales use CRM to store all customer information and conversation backlogs. When these two function together, it is obviously the most powerful option a business has to increase sales revenue. Till then, listen to Jack Vincent as he draws examples from real-life courtships and explains how sales in nothing but a love affair. Yeah, we were on automation but to automate and increase your sales revenue, you will first need to know your customers. Isn’t that we discussed all through this article?! Did I miss out on any points? Do you know more ways to increase sales revenue using automation? Share them all in the comments section below so that we all stay updated. B2B Marketers; Never See Your Emails in Gmail’s Promotion Tab Again! It’s true that sales revenue can be increased using implementing marketing automation. I have given it a try. It was an interesting blog which explains the beneficial features of automation software and how to utilize it to make revenue. Well -written post! Excellent work I found every marketing automation strategy very easy to follow also. Well written content, as it gives a clear explanation about the beneficial features of automation software and how to utilize it to make revenue. Thanks a lot, Pritha! Well written Pritha, there are some must-read strategies which can quickly improve sales. Loved to read this post about marketing automation software as it helps a marketer to get a clear picture of the beneficial features of automation software. The above post about marketing automation software helps one get a clear picture of the beneficial features of automation software and how to utilize it to make revenue. “The fact that marketing automation software is so comprehensive is a blessing and a curse. While it can cause quite a few headaches in researching whether or not it’s right for you, you’ll be glad of it if you do end up biting the bullet. This post has definitely given a better understanding of how one might be able to use automation software. These are some wonderful list of strategies that everyone who wishes to improve sales must implement. At the end of the day we must always implement a marketing automation strategy that works for us as no marketing strategy is identical. Marketing is all about experimenting and finding out what works for us! The marketing automation software market is projected to be worth $5.5 billion by 2019. This shows that many businesses are moving towards employing a Marketing Automation software. Marketing Automation can be a game changer for our business if implemented in a proper manner. These strategies you mentioned were worth a read, thanks for sharing! Hi Pritha, this a great post and so easy to follow! I would like to mention that according to a research, approximately ¾ of sales revenue comes from long term opportunities over six months. Lead nurturing campaigns has a sole purpose to move buyers from awareness, to inquiry, to consideration and finally to purchase. And obviously that is done by appealing to different audiences in different stages of the buying process. I, as a marketer believe that by implementing these strategies we will definitely find an increase in sales revenue.